A self portrait of former President George W. Bush which is part of the exhibit "The Art of Leadership: A President's Diplomacy," is on display at the George W. Bush Presidential Library and Museum in Dallas, Friday, April 4, 2014. A series of paintings of veterans that Bush painted is set to be released in February 2017. President George W. Bush is coming out with a new book. "Portraits of Courage: A Commander in Chief's Tribute to America's Warriors" will feature 66 oil paintings and a four-panel mural by Bush of military veterans and those in active service, the Crown Publishing Group told The Associated Press on Wednesday. The book is scheduled to come out Feb. 28, 2017, and will include an introduction by Bush and forewords by former first lady Laura Bush and by Gen. Peter Pace, former chairman of the Joint Chiefs of Staff. "This is a book about the men and women who have been tremendous national assets in the Armed Forces -- and who continue to be vital to the future success of our country," Bush writes in the introduction. "The greatest honor of the presidency was looking them in the eye and saluting them as their Commander in Chief. And I intend to support and salute them for the rest of my life." "Portraits of Courage: A Commander in Chief’s Tribute to America’s Warriors" by President George W. Bush. The book will be released in two editions: a $35 hardcover and a $250 "deluxe" volume, cloth-bound and signed by Bush. According to Crown, "Portraits of Courage" also will have stories written by Bush in "his inimitable voice" about each of the subjects. "As the stories unfold -- some of them inspiring, some of them heartbreaking -- readers will encounter the faces and the hearts of those who answered the nation's call and learn from their bravery on the battlefield, their journeys to recovery, and the continued leadership and contributions they are making as civilians," the publisher's statement reads. No financial numbers were disclosed. Bush was represented by Washington attorney Robert Barnett, who has also handled book deals for President Barack Obama and 2016 Democratic presidential contender Hillary Clinton. Bush's previous books include the best-sellers "Decision Points" and "41," about his father, former President George H.W. Bush. 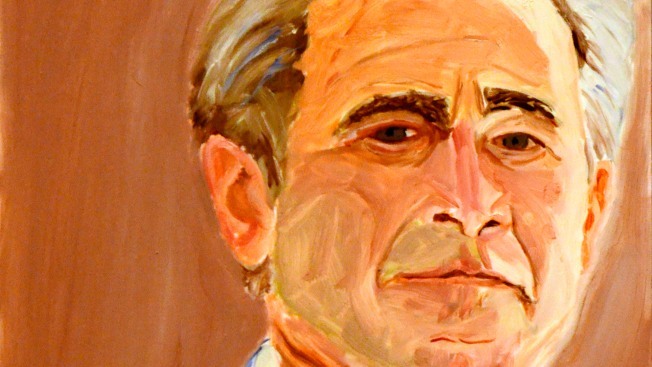 Bush, who has become an avid painter since leaving the White House, is donating any net author proceeds to the George W. Bush Presidential Center and its Military Service Initiative, which helps post-Sept. 11 veterans and their families' transition to civilian life. Former First Lady Laura Bush and Jenna Bush Hager chat with "Tonight Show" host Jimmy Fallon about the evolution of former President George W. Bush's artwork and Laura's mom texts. Bush was expected to mention the book in a speech Wednesday at the Fort Carson Military Community Transition Summit at Fort Carson, Colorado. The paintings from "Portraits of Courage" will be on exhibit in 2017 at the Bush Center, in Dallas, from March 2 through early October.